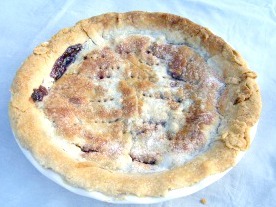 Old Fashioned Pie Recipes include cream pies, no bake pies, cobblers, a Flaky Pie Crust, quiche and an easy, delicious Cream Puff Pastry, to delight your family and guests. The world loves pies. Folks have been baking them for hundreds of years. Our Pilgrims loved them so much they brought their favorite recipes, which consisted mostly of the mincemeat pie with them. They discovered how to make fruit, vegetable, custard and cream pies, using the foods American Indians taught them to eat. Popular magazines were featuring holiday pie recipes in 1935. Here you will find an Old-Fashioned Pumpkin Pie that was featured in the Good-Housekeeping magazine, November issue, in 1937. The pie has been the winner of polls I have done online asking fans if they prefer pies or cakes for desserts. I found it amazing that all such polls resulted in the the same results. Pies won every time! So, whip up a favorite traditional pie in our delicious, homemade Flaky Pie Crust from scratch or other no bake crusts and make any meal, a special occasion for your family and friends! A juicy, delicious Old Fashioned Cherry Cobbler made easy with canned Sour Red Cherries, self-rising flour, and butter. An old fashioned recipe that is not sweet, not too spicy and baked in a deep dish flaky pie crust. It is topped with a delicious glaze of cream and sugar. An elegant Old Fashioned Recipe made with milk, eggs, sugar and flavorings. Tart filling in a honey graham cracker crust. Topped with meringue and coconut and baked long enough to toast. Yummy! Scrumptious Blackberry Cobbler with bring happy memories of blackberry picking to your table. Awesome, easy dessert! Made with raisins and spices topped with a glazed crust of self-rising flour, brown sugar, butter and nuts. Make the Banana Split Pie into a pie filling by adding less milk per pudding box directions. Make the Butterscotch Pudding into a pie by cooking the pudding a few minutes longer until is as thick as a pie filling.